Skiing, whitecaps, and wintertime getaways are traditionally associated with a trip to the Alps, but what happens when the temperature rises and the snow melts? For the avid biker, adventurer or summertime tourist, the Alps offers something beyond the slopes: a chance to test your mettle (and your quads) against a plethora of challenging trail options, on road or dirt! While the world is full of places to get your bike on, there are a few key reasons why a summertime biking trip to the Alps should be next on your bucket list. Riders can choose to climb one of the many cols, such as the famed Alpe d’Huez in the Oisans, or they can choose to take a gondola up into the mountains and charge downhill on a mountain bike. For the rider looking to test their grit, there’s the Col du Sabot in Vaujany. It is a climb considered more difficult the d’Huez, and far higher up in the mountains. However one climbs – by lift or by legs – it is a fact that what goes up must come down. The Alps offers a variety of thrilling ways to descend. 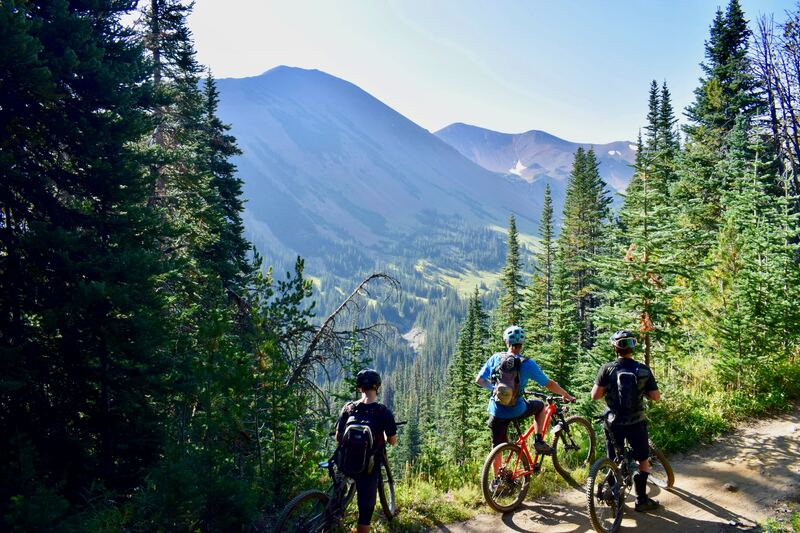 Riders can hop on one of the many mountainside trails and enjoy the massive adrenaline rush as their bikes skip, bump and rush down the steep terrain. For those who do not consider themselves danger-junkies, there are countless intersecting trails to be followed on the way back down from the peaks. Like eagles? Who doesn’t? Cyclists can ride through The Oisans Balconies and stop at a few eagle’s nest lookout points for a chance to catch a glimpse of one of the majestic birds. Or, riders can take in some gorgeous architecture while on their way through the Villard Notre Dame. Adventurers should be mindful to bring some lighting gear with them for this route, however, as there are several long and dark tunnels to manoeuvre through. For bikers looking to stay off the beaten path, there’s the short-but-invigorating Vaujany Surge Shafts, which offers a sharp climb up, but plenty of fun navigating the switchbacks on the way down. Families will enjoy the mostly-flat and pleasant Bourg d’Oisans Plain, with its circular route and pretty scenery. Vacationers who want to enjoy the trails without blowing out their legs can rent an electric bicycle. These powered bikes still have pedals, but their booster system allows riders to complete rough or long rides that otherwise wouldn’t have been able to make the itinerary. The bike is smart and adjusts its assistance to the rider’s pedalling power, offering no more aid than is needed. This piece of equipment basically removes any excuse not to take a cycling trip to the Alps! When choosing a vacation destination, it’s important to take into consideration what will actually allow one to relax and reset. Cycling has been proven to decrease stress, among its many other health benefits. Plus, taking in the fresh air amidst beautiful surroundings and feeling a sense of accomplishment for completing some seriously rough routes? Say hello to restoration. Beyond the obvious physical health benefits of cycling, riders will find natural support in the Alps via the many fresh spring water spouts ready to refill an empty canteen. Hungry? While riding through the mountains, cyclists and mountain bikers will find many options for a quick bite, coffee or even wine, if they want it. Fresh cheese? Yes, please! The views while riding in the Alps are spectacular. From vast, Sound of Music expanses of green and yellow grass to lush trees, lakes and meadows, the Alps has no shortage of natural beauty to offer riders as they pedal and weave through the trails. Lucky cyclists may even get a chance to ride alongside some local cows or sheep as they graze the land freely. Consider summer the Zen season and let the ride become a centring meditation. Wintertime is considered the on-season for the Alps, which makes summertime the off-season. Prices are lower, as is the population, giving riders and travelers the chance to enjoy their time in greater solitude and simplicity. With all the intersecting trails coming together like a spider web of dirt and road, adventurers can enjoy a blend of the known and unknown on their rides. Planning is important, but the Alps offers the opportunity to make moment-to-moment riding decisions on the descent, especially. One may generally know where they’re going, but the joy is in the journey taken to get there. Without adventure, life would be dull. For riders seeking a true challenge among some of the most breathtaking sights in the world, the Alps has both in spades. Summertime never looked or felt so good. Prepping for an outdoor adventure? Make sure you’ve got the gear you need.